Luthier & renown pickup guru Jason Lollar has an excellent Youtube channel just loaded with priceless how-to demo content for helping your guitar maintenance and upgrades projects go smoothly! The above clip is part 1 of a three part tutorial on installing Strat pickups. 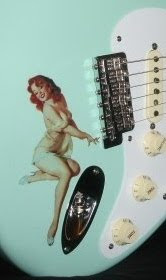 Although Lollar's archive also covers humbucker and P90 installations, it's clear that Jason is a Strat man, as Strat related resources abound. His most viewed video is on pickup adjustment, focusing on the Strat. Pimp Your Strat - Directory for lots more upgrade resources.